Do you often experience blurred vision, eyestrain or headaches after being on your computer or smart phone for an extended amount of time? If so, you may be experiencing a condition known as Computer Vision Syndrome. Fortunately, eye doctors have developed a special type of eyeglasses, known as computer glasses, that are made specifically to address the unique needs of those who are on the computer or other electronic devices for extended periods of time each day. 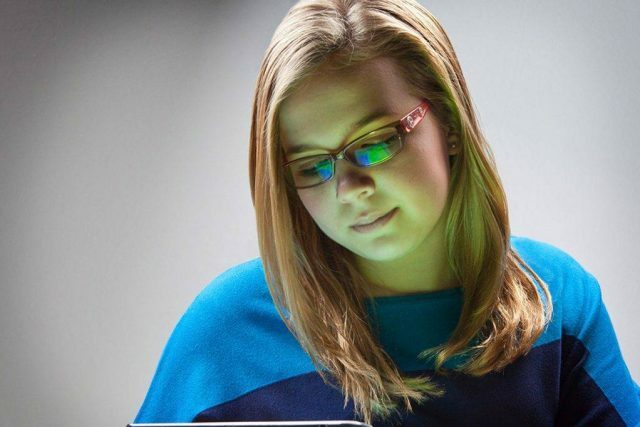 Computer glasses are often equipped with specialty lenses, such as BluTech and Crizal Prevencia, that are meant to reduce or eliminate many of the harmful side effects linked to increased time in front of computers and other electronic devices. This is accomplished by selectively filtering out blue light, which enhances visual comfort and minimizes eyestrain. At the same time, these lenses allow non-harmful light to pass through, allowing for the clearest vision possible. Whether glare, scratches, smudges, dust, water, or UV light — Crizal No-Glare lenses deliver a difference you can see. The benefits of Crizal lenses include: reduction of nighttime glare, giving you better vision and a safer driving experience and reduced digital eyestrain by limiting glare from electronic devices, by providing 25 times more UV protection than going without eyewear. Crizal lenses are designed with durability in mind, and engineered to provide long-lasting, clean, clear vision. Specialty lens coatings may also be applied to computer glasses. Among the most popular of these specialty coatings is HOYA Recharge. This special lens treatment reflects about 30% of harmful blue light away from the eye. In conjunction with the specialty lenses mentioned above, HOYA Recharge can help significantly increase the amount of blue light filtered or reflected away from the eye, making computer use noticeably more comfortable. Computer glasses are an absolute necessity for maintaining both your short term visual comfort and long term visual health as you work and play in a world increasingly dominated by computers and smart phones. For more information about how computer glasses can help you, speak to your eye doctor today.